SPECIFICATIONS: The Plastic Vent is made of High Density Polyethylene (black) with a base flange diameter of 10.5" and a height of 7.75". 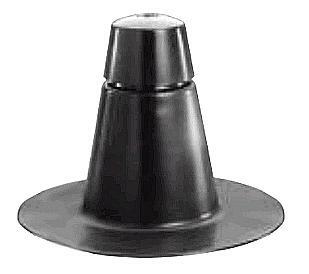 The stand pipe has a 5.5" base opening and a 2.5" counter flashing rain cap that is a locking, vandal proof type. High Security Roof Vent / Flashing with Locking Cap, 7 Inch ID, 2-way Breather Vent. Price/Each. M-105, Black HDPE 2-Way Roof Insulation Breather Vent, for BUR and Modified Roofing. Size is 5-1/4 ID x 8 high , 10-1/2 OD Flange. Price/Each. Roof Breather Vent, 2-Way, White PVC, 8 inch High, 5.25 Inside Opening at Base, 10-1/2 OD. Marathon M-105. Price/Each.